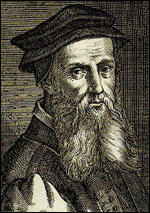 John Bale, the son of Henry and Margaret Bale, was born near Dunwich in Suffolk, on 21st November 1495. He was educated at the Carmelite convent at Norwich and Jesus College. It seems that while at Cambridge University he did not join the reforming group led by people such as Hugh Latimer, Thomas Cranmer, William Tyndale, Nicholas Ridley, Miles Coverdale, Nicholas Shaxton, Matthew Parker, Robert Barnes and Thomas Bilney. In 1530 he became prior of the white friars' convent in the port town of Maldon in Essex. In 1533 he was promoted to the Carmelite convent at Ipswich, and he had become prior at Doncaster. By this time he had began to show interest in the ideas of Martin Luther and in 1534 he was charged with heresy, but escaped conviction. King Edward VI died on 6th July, 1553. 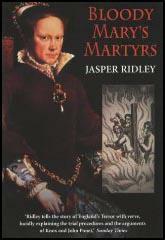 Queen Mary now ordered the arrests of the leading Protestants in England. This included Archbishop Thomas Cranmer, Bishop Hugh Latimer, Bishop Nicholas Ridley and Bishop John Bradford. To their mutual comfort, they "did read over the new testament with great deliberation and painful study", discussing again the meaning of Christ's sacrifice, and reinforcing their opinions on the spiritual presence in the Lord's supper. (24) Eventually all four men were burnt at the stake. 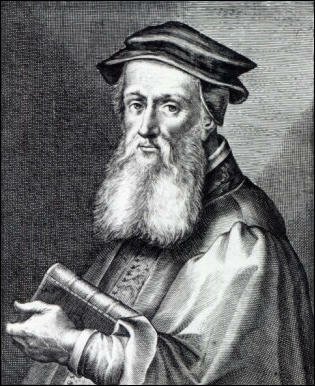 John Bale died on 26th November, 1563. Bale's writings are indeed notable for a consistent historiographical vision which is expressed most fully in his Image of both Churches, but is also vital to the polemical plays, propaganda tracts, and works of scholarship written from the 1530s onwards. Above all, his interpretation of Revelation affords an apocalyptic paradigm for virtually everything that he wrote. In his eyes, a proper understanding of Revelation should enable believers to trace the historical trajectory of the conflict between ‘true’ and ‘false’ churches through the seven ages prophesied by the blowing of seven trumpets, the opening of the seven seals, and the pouring of the seven vials. These ages proceed from an initial period of apostolic purity to the sixth age, which encompasses the persecution of the faithful from the time of John Wyclif until Bale's own lifetime. Wyclif and William Tyndale are leading representatives of the ‘true’ religion which had been brought directly to England by Joseph of Arimathea, one which remained uncorrupted by fraudulent apostolic succession of Roman pontiffs who act as agents of Antichrist. Present history looks forward to the final age, when the world as it is known will come to an end.